As you may recall, way back in early 2015, a little app named Meerkat suddenly burst onto the scene at SXSW. It suddenly became the app that everyone had to have - while live-streaming, as a practice, had existed for some time in various forms, Meerkat was the first app to utilize mobile technology and advanced connective capacity to make it immediate. You just press a button and you're live, anytime, anywhere, broadcasting to anyone who wanted to tune in. And along with that surge in hype came money - the new app quickly raised $12 million at a $40 million valuation, with high profile investors like Gary Vaynerchuk, Ashton Kutcher and Jared Leto jumping on board. Other investors included Universal Music Group and various talent agencies - many saw Meerkat as the next big social platform, a new breeding ground for the next generation of social stars, and they were keen to get in on the ground floor to capitalize on its coming success. But sadly for Meerkat, it wasn't to be. Shortly after release, Twitter unveiled their own live-streaming app, Periscope, which they'd purchased only weeks earlier, then Facebook brought its considerable presence to the live-stream party months later, in the form of Facebook Live. The increased competition from larger, more established and better funded rivals stunted Meerkat's growth, as did Twitter's decision to cut the app off from its social graph. Eventually, with the rising emphasis on live-streaming from the social giants, Meerkat conceded, announcing around a year after that initial buzz that the app would be shifting focus. "1-to-many mobile live video is still in a state of infancy and a lot of its success depends on these media, stars, or influencers. Their main currency is audience and viewership. As long as we are competing on those with Twitter/Periscope and Facebook Live, we don't think the current Meerkat product is set up to win. " As part of that announcement, however, Rubin did note that they were working on something new. "There is a bright spot to all of this. We found the best Meerkat moments happened when people who knew each other (either in person or online) came together live and interacted in realtime. We saw this in the conversations when the threads would go on and on and on. We especially saw this in cameo when broadcasters were able to see their audience and interact in a more human way, people passed around the camera for a campfire chat session. And we saw many of these groups have the best repeat behavior of anyone." That "campfire chat session" reference clearly held particular resonance, as the Meerkat team have now officially announced their latest effort - a group live-streaming app called Houseparty which aims to facilitate group chats of up to 8 participants at a time). The app has actually been available since February, and is closing in on its first million users. Rubin and his team opted to keep the project quiet and separate from Meerkat, enabling them to develop their new offering without the pressure of being Meerkat 2.0 - recode first reported the Meerkat connection to the app back in June. Similar to another failed live-streaming app Blab, Houseparty aims to reduce the performance anxiety of solo live-streams by enabling users to get their friends involved. But if Meerkat didn't pan out, and Blab also couldn't develop a sustainable business model, why does Rubin think Houseparty will be any different? First off, the intended audience for Houseparty is different. As noted by The Verge, Rubin and Co have honed their focus on students as the key market for the new offering. "...the company dispatched employees to college campuses in Alabama, Ohio, and Arkansas. They met with fraternities, sororities, and other student groups to show them how the app worked. Students began using the app to make Friday night plans, to reminisce the morning after, and to do homework together during the week." That focus puts the app more in-line with something like Yik-Yak, which saw significant growth till more recent stagnation. But Yik-Yak's loss of momentum has been more attributed to gradual lack of interest in anonymous apps, as opposed to functionality - Snapchat and Instagram have slowly taken over as the key college apps, where Yik-Yak once lead the way. Given this, Houseparty could fit into that niche and provide a service no other platform is currently offering, with the ability to quickly start up group chatrooms and "always on" conversations within the app. In addition to students, Houseparty might also prove beneficial for coaches and group admins who want to generate more connection with their audience - but then again, that's what Blab did too. So how can Houseparty succeed where Blab failed? Part of Blab's problem was that the platform was very expensive to run. Blab as built on a service called TokBox which charges per minute of broadcast, which means that as Blab gained more popularity, their costs rose in-step. Eventually, the plan was obviously be to offset those rising costs with some form of monetization, but Blab never got to that stage, as those costs remained while user take up reduced, lessening their revenue potential to the point where the project was no longer viable. Houseparty, on the other hand, doesn't use the same system, though their usage must be expensive all the same, particularly considering they can stream eight people at a time. While it's unclear exactly how Houseparty aims to scale such use, clearly Rubin and Co have learned lessons from Meerkat, Time will tell if they've learned enough to counter those rising costs. But that then leads to the bigger question - technical issues aside, how can Houseparty build a big enough audience to become a more significant consideration in the live-streaming space? The answer here is it probably can't - if a significant enough number of users show interest in multi-person live-streaming by using Houseparty, how long do you think it'll be before Facebook introduces the same option? No doubt The Social Network's already experimenting with such tools, but again, the data costs would be prohibitive - you'd need to show significant enough opportunity for scale before making that kind of investment. As such, Houseparty may eventually prove to be little more than a case study for the bigger players. To beat this, Houseparty will need to ensure they're adding in innovations and tools that help build community loyalty, and the app does have its own flourishes, like a banner saying "Stranger Danger" when a friend of a friend joins a chat. 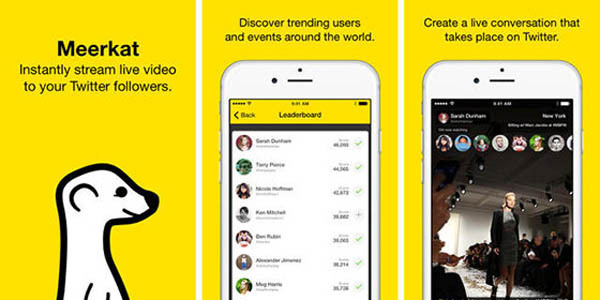 But if the app does prove popular, that may actually be its undoing - similar to what happened with Meerkat. But then again, if anyone knows the risk/reward metrics of live-streaming, Ben Rubin would be the guy. Maybe he knows something we don't. You can download Houseparty for iOS or Android now.